We are finally finished with the wood for this winter. I am so proud of my hubby! He would cut and split a load almost everyday. Once our pile was humongous, it was time to move it. 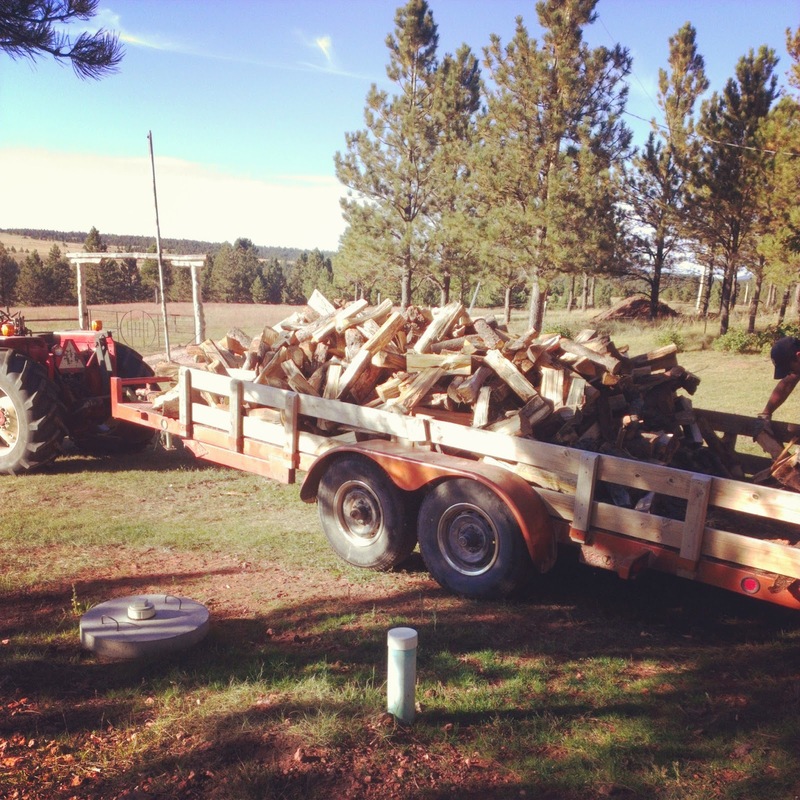 He used the tractor to load the wood onto the trailer, then the family worked together to stack it. It never ceases to amaze me how much firewood is handled. The tree is cut down, chunked, then loaded and moved home. There it's split and later stacked. Months later it will be carried into the house and loaded into the stove. Of course it doesn't end there, don't forget about having to empty the ashes. When under the deck was full, we ended up with over 10 chords. 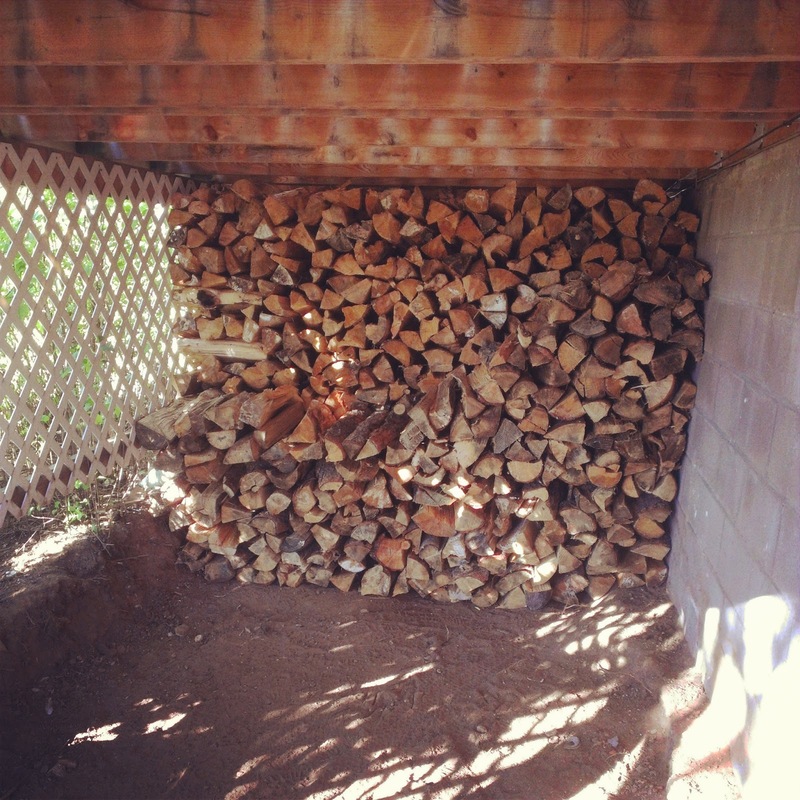 There is still quite a pile by the log splitter, so we are definitely set for this winter. Finally. 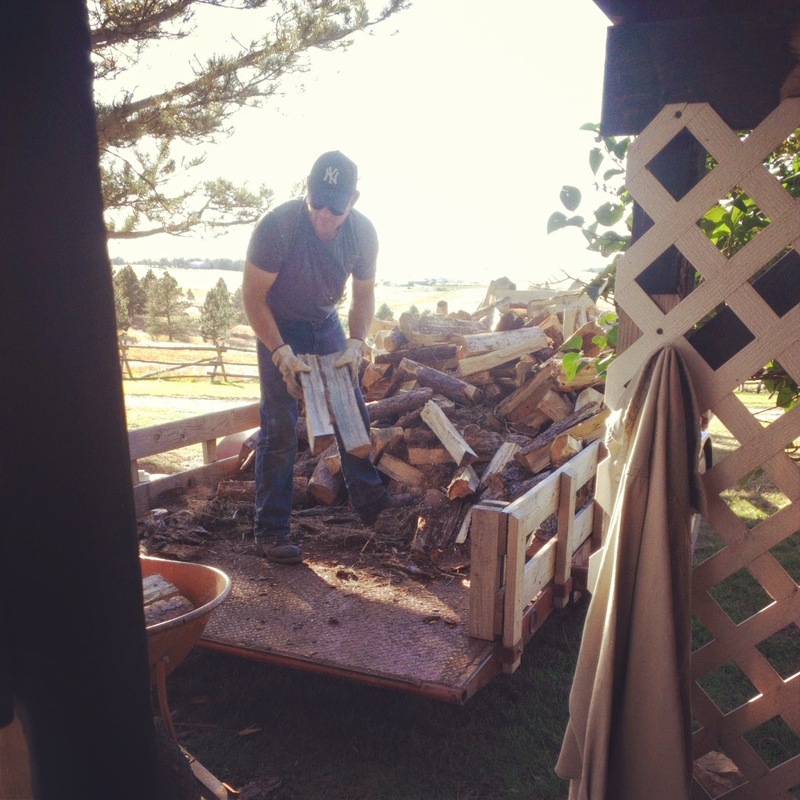 In reading your story of preparing wood for the winter, I was reminded of a quote from one of the Little House on the Prairie books...Pa Ingalls was quoted by Laura as saying that, "Wood warms you twice...once when you chop it and again when you burn it." I think you can agree that it probably warms you more than twice! 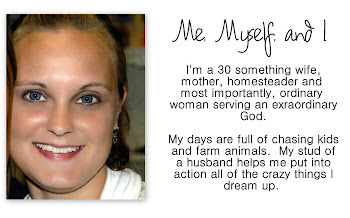 I enjoy your blog. I liked the quote up ahead of me too... "warms you twice"
In this case... I can't help but wonder how much of a wind break it stacked against the house like that. We had a porch built on our house in 2010-- and then a roof over it. I've told The Honey-- that having that porch with the skirting around it has done wonders to keep the cold off the N.E. wall of the house. He didn't believe me until last winter. :) It's true-- the porch, the skirt, the roof...all break the wind-- and the livingroom stays warmer in the winter. It stays cooler in the summer too-- because the awning keeps the morning sun from beating in the big windows. That stacked wood...has to be some type of insulation where y'all live!